Last Month I went to Chesapeake Light Craft’s Open house and “Okoumefest”. There I was introduced to all their boats and how they are designed, built, and kitted up. I also learned that they buy all their Okoume and Sapele Plywood from the importer based somewhere in New Jersey. My local mill also carries Okoume and Sapele, so it is a safe assumption they get it from the same source as we are both Located in NJ. With tools in hand, a small amount of dangerous knowledge, and a bit of know-how. I ordered just the plans from CLC and the plywood from the mill. Once both were in my grubby little hands, it was time to get down to building. First up came the building table. 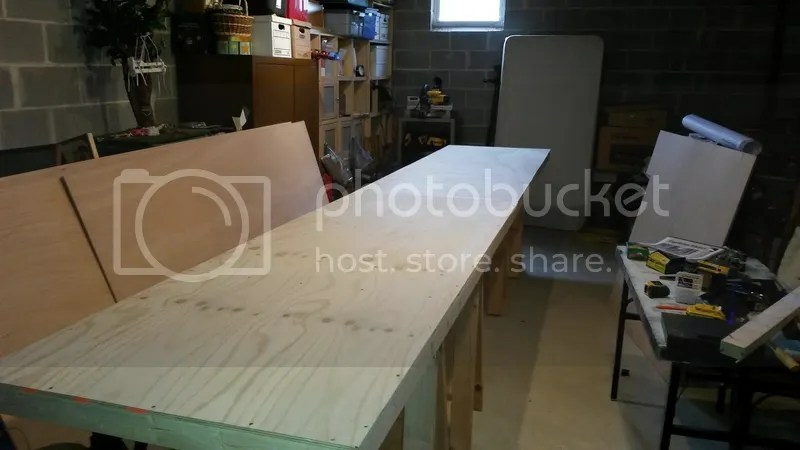 This is two 8×3 foot tables clamped together to form a 16 foot by 3 foot long place to work. It takes up a large chunk of my basement and makes it possible to build in some amount of comfort.